Population of Calgary | Do YOU Know how Rapidly THAT has Changed? What is the population of Calgary? What is the population of Calgary? Do we have a useful interpretation for the numbers representing this changing total. We have a civic Calgary census every year. The figures compare with the Statistics Canada population counts once every five years. In 1980, the city had about 560 thousand people and in 2008, about 1,043 thousand, the third largest in Canada. From these two data points, we get an average of around 2.2% increase per year, with some variation depending on the method of calculation. Another source of variations is changes in the rate of growth in the recent Calgary booming economy. For instance in the years immediately following the crash after the 1970s oil boom, the population actually declined. The city lost a net 3000 people between 1982 and 1984, as newly unemployed people "got the hell outta here". At other times we saw well over 20,000 flock to the city in a single year. And that is in addition to the seven to nine thousand net population increase owing to births. Not bad for our little spot on the map. A handy way of making this kind estimate is the rule of 72, where you divide 72 by the percentage rate to get the number of years it would take at that rate to double the population in this example. Here is a quick look at the the population of Calgary since 1884 when Calgary had 506 people, 4000 by 1900, 11967 in 1906, booming to 43704 in 1911, doubling after another 30 years and making 100000 around 1947. It progressed to 200000 before the 1960 census, 400000 sometime in 1970, 560618 in 1980, 625143 in 1985, 692885 in 1990, 749073 in 1995, 860749 in 2000, and 956078 in 2005. We made it to a million shortly before the 2007 civic census, and over 1,200,000 more recently. See the graph below. Using the rule above, we get our most recent doubling in the last 33 years or so. The population numbers up to 2016 (below) confirm that, more-or-less. Extrapolations are risky. That is where you use current data to make future projections. Regardless, predictions were made, several years ago, for the city's population to reach a million near mid-2007. Over this kind of short term, the guess is likely quite good. And it was. The projected rates of growth are lower (than those listed above) in present and future years. By the way, the 2016 Federal Census indicates that Calgary now has the city at 1,239,220 with a CMA (Metro) of 1,469,300. 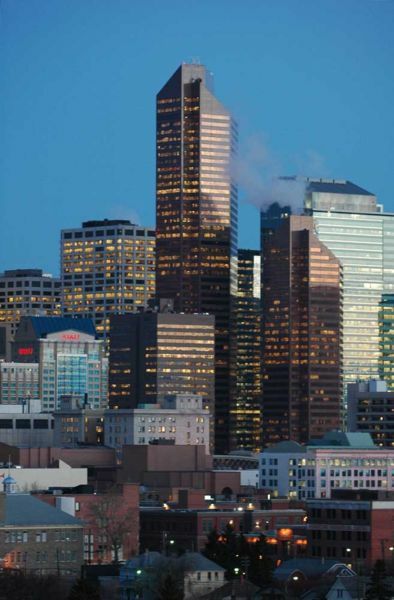 Another pivotal point in changing the Calgary population was the hosting of the 1988 winter olympics. We saw a great change in civic infrastructure preceeding these games, and with it a steadier influx after that event. As mentioned, the 1980s were quite lacklustre, and so was the early part of the 1990s. Many Canadian centres saw sharply increasing unemployment and out-migration. Calgary did too, but with relatively little loss. Only once. And most of those years saw increasing population gains until we once again described it as a population of Calgary boom by the end of the century. Where to have fun in Calgary meet people and such? Try one of these places. Or go back from Population of Calgary to the Calgary Houses for Sale web page.